With the historic inter-Korean summit still dominating the news, behind-the-scenes stories are being revealed by those who accompanied President Moon Jae-in to the meeting with North Korean leader Kim Jong-un. Here are some notable moments from the 12-hour inter-Korean summit. 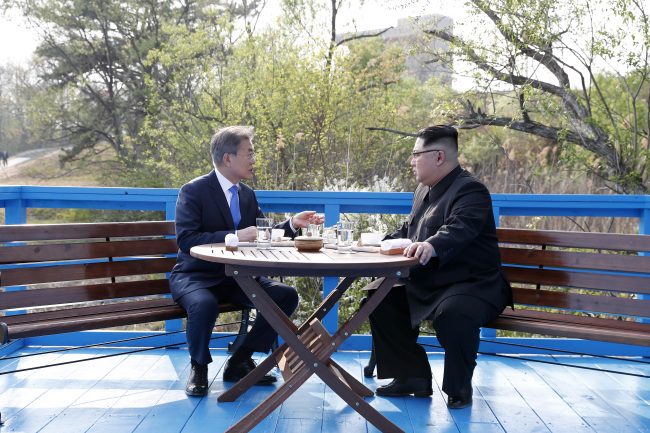 A fascinating scene was of the two leaders walking on a foot bridge in Panmunjeom, sitting on benches and talking privately for about 30 minutes. The leaders sometimes laughed together, and at other times appeared more serious, with them thought to be candidly talking about one of the most pressing tasks -- denuclearization of the Korean Peninsula -- ahead of Kim’s planned meeting with US President Donald Trump in May or in early June. “It was unimaginable in the past that the two would have a conversation without anyone around,” Unification Minister Cho Myong-gyon said during a radio show Monday. Their one-on-one conversation continued after they went back to the Peace House, the summit venue. They talked for about 15 minutes alone in a meeting room before signing the Panmunjeom Declaration, Cho said. “The leaders had to walk a long way and up a hill, so North Korean officials were reluctant about it until the last minute. It seems that Kim made the final decision to do so as the inter-Korean summit got closer,” said an official from the presidential office. At around 8 p.m., North Korea’s leader Kim Jong-un, known to be a heavy smoker, quietly walked out of the banquet venue and lit up a separate location. That was the only time Kim was spotted smoking during the day of the summit. “We heard that Kim Jong-un had been a heavy smoker. But we could see him refrain from smoking in public, considering the symbolism of the inter-Korean summit and the number of South Korean and North Korean officials at the scene (on Friday,)” an official from the presidential office said on condition of anonymity Sunday. 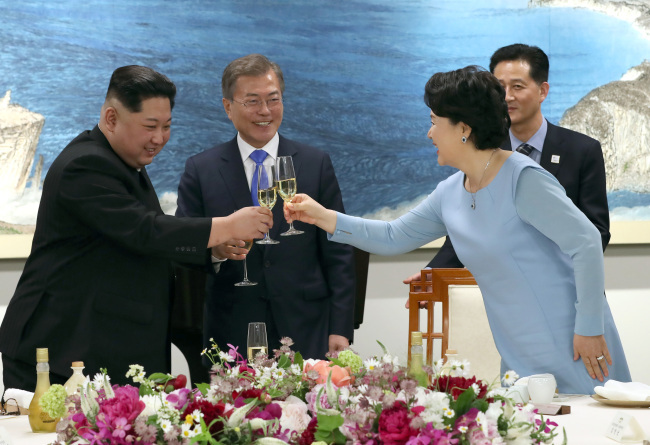 Cheong Wa Dae had set water, tea and an ashtray on the table near the benches where the two leaders sat together, but Kim, who is thought to be aged 34, did not take out a cigarette in front of Moon, 65. North Korean leader Kim Jong-un did not once refuse the strong liquor poured by South Korean participants during the 160-minute dinner banquet, according to the participants at the event. A total of 30 guests were invited from the South and 24 from the North. At the summit, Moon and his wife Kim Jung-sook, and Kim and his wife Ri Sol-ju, as well as other participants had an alcohol prepared by the South Korean side -- Moonbaeju made of millet and sorghum, which has its origins in North Korea’s Pyeongan Province, and contains 40 percent alcohol. The first ladies -- Kim and Ri -- also had a drink together, exchanging conversation about music and art, according to presidential vice spokesperson Ko Min-jung. 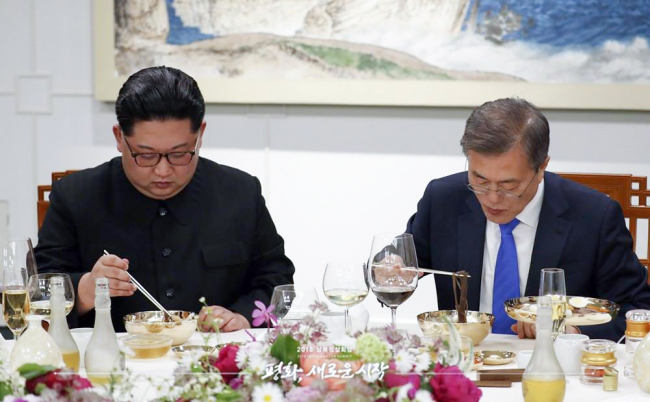 North Korean leader Kim Jong-un made mention of naengmyeon – a type of cold noodles -- brought from the North’s capital Pyongyang for the summit banquet in an opening remark on Friday. South Koreans were seen flocking to restaurants serving Pyongyang-style cold noodles the same day. When Moon’s vice spokesperson Ko Min-jung told guests that the cold noodle restaurants in Seoul were packed with South Koreans, they erupted into laughter, according to the presidential office. A head chef from Okryugwan in Pyongyang -- a symbol of the culinary life of Pyongyang -- brought a noodle-making machine and broth, and made noodles on the spot to serve the North’s signature cold noodles.